Applications are invited from the intending eligible Candidates from the Citizens of India as defined in the article 5 to 8 of the constitution of India, for filling up of the vacancies as indicated below in the cadre of Grade – III Post under the jurisdiction of Inspectorate are of Dibrugarh District Circle, Dibrugarh. No. of post: 28 nos. 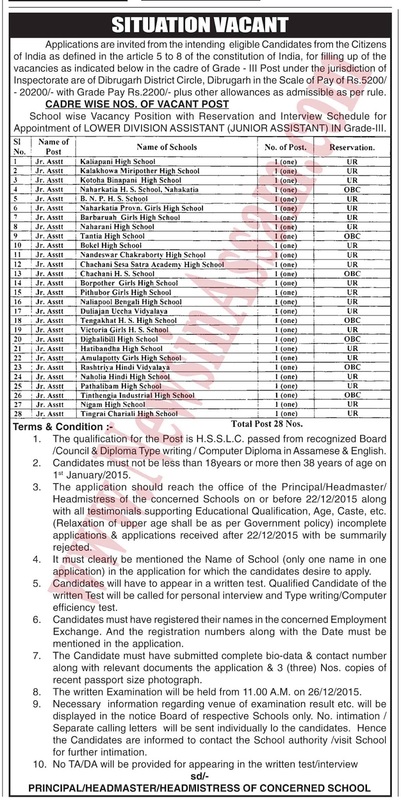 Qualification: H.S.S.L.C. passed from recognized Board/Council & Diploma Type writing / Computer Diploma in Assamese & English. Scale of pay: Rs.5200/- 20200/- with Grade Pay Rs.2200/- plus other allowances as admissible as per rule. Age limit: Candidates must not be less than 18years or more then 38 years of age on 1st January/2015. How to Apply: The application should reach the office of the Principal/Headmaster/ Headmistress of the concerned Schools on or before 22/12/2015 along with all testimonials supporting Educational Qualification, Age, Caste, etc. (Relaxation of upper age shall be as per Government policy) incomplete applications & applications received after 22/12/2015 with be summarily rejected.